Neil & Pegi say "Good Night. Thanks for coming. We love you all." Finale Day #2: Who's Gonna Stand Up? Neil, Pegi & Ben Young say "Good Night. Thanks for coming. We love you all." Finale: "One of These Days"
Nils Lofgren w/ Neil Young - "Believe"
Thanks to Hounds That Howell for photo support! This weekend, the 29th Annual Bridge School Benefit Concert will be held on Saturday, October 24 & Sunday, 25, 2015 at Shoreline Amphitheater, Mountain View, CA. Check for updates via The Bridge School | Facebook and Bridge School | Twitter. 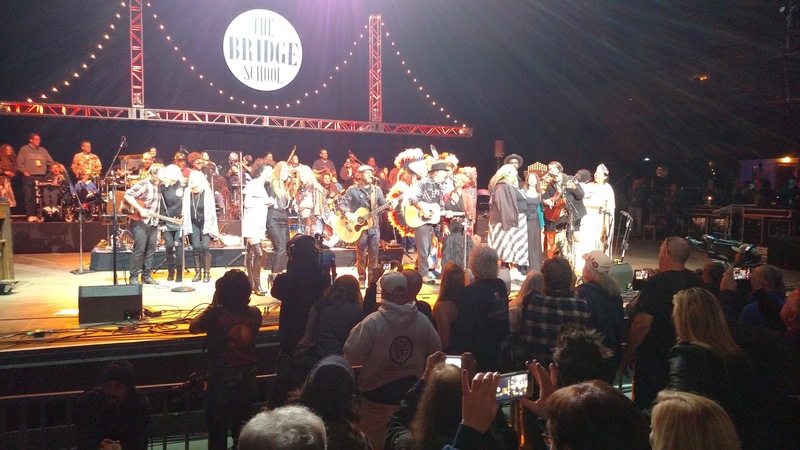 More on last year's Bridge School Benefit Concerts - October 25 & 26, 2014. Thanks BabboB! Ben is great acoustic. @SONY - good question. You haven't missed it anything. No word on stream but it doesn't seem like it this year. So come on out. Good tix still avail we hear. I hope it gets streamed. There have been some epic performances at this show throughout the years. I recall the Oh Susannah with Dave Matthews, put me in a spell for weeks. I learned that song the day I heard it. And the Lou Reed tribute, etc.....C'mon Neil! Some us can't get there in time. I have it on terrible authority and a totally made up idea of mine Springsteen will do Helpless with Nils and Uncle Neil. Just watched Farm Aid and listening to Santa Barbara 10/10. Sometimes a Horse just smells like a horse. POTR smells like fresh mountain air. Even gives new life to one of Ol Neils most played songs, Love and only Love. Just wonderful stuff. The Nelson Boys really get this guy. he couldn't have picked a better band to play with. Funny stories too about free seeds and wanting to get arrested for ridiculous CA law about moving seeds more than 3 miles. 14 Junkies too sick to work. One sells diamonds for what their worth. Down on Main St where disappointment lurks. Time Fades Away. sounds allot like Dylan. Not much in there about Neil's performance with POTR; probably due to time difference and/or publishing deadline (they came on around Midnight Pacific Time). It will be nice to hear more and see some videos. 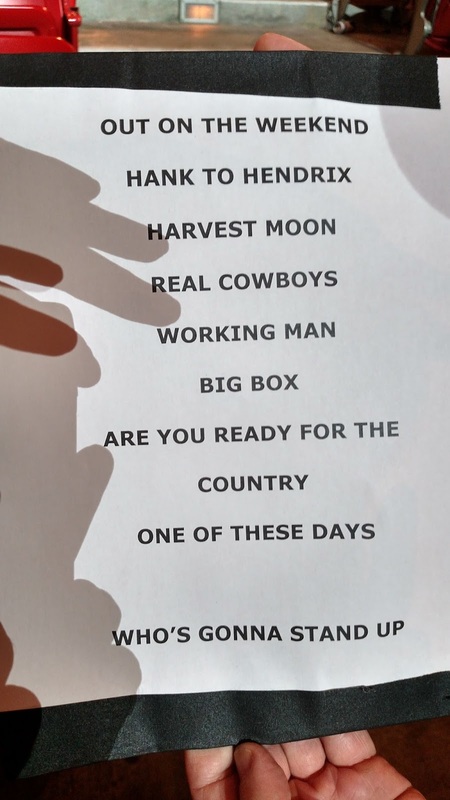 Interesting set list for Day One (thanks TW!). Seems quite thoughtful and reflective; hope that both Pegi and Neil are doing well in their new lives. Have a great time all of you going to today's show! Wish that I could be there; maybe finally next year. "Above all else, deep in my soul, I’m a tough Irishwoman." @w san jose CA - nice try, but we got Southern Man w/ Nils! @ Mr H. Next year will be 30th Anniversary. Hope to see you again, our friend. The top attraction on this year's bill was the reunited Dixie Chicks, one of the biggest country acts of all time. The group -- vocalist Natalie Maines, guitarist Emily Robison Strayer and fiddle player Martie Maguire -- sounded terrific onstage, showcasing the wonderful harmonies and edgy country that resulted in multiple Grammy wins and over 30 million albums sold. The Dixie Chicks opened their 35-minute set with "The Long Way Around" from "Taking the Long Way," the 2006 blockbuster that still stands as the band's most recent album. The group mined its one catalog for such gems as "Sin Wagon" and "Not Ready to Make Nice," and even threw in a couple of cover songs. The first was expected - the Dixies' smash take on Fleetwood Mac's immortal "Landslide." The second offering was a complete surprise - a powerful play on Lana Del Rey's "Video Games." Another highlight of the night was Ryan Adams' set. The folk-rocker was absolutely charming onstage, making up songs on the spot and otherwise goofing around with the crowd. Unfortunately, he didn't perform any material from "1989" -- Adams' inspired re-imagining of Taylor Swift's entire "1989" album -- but he did play his wonderful "New York, New York" as well as revisit his Whiskeytown days for "Jacksonville Skyline." 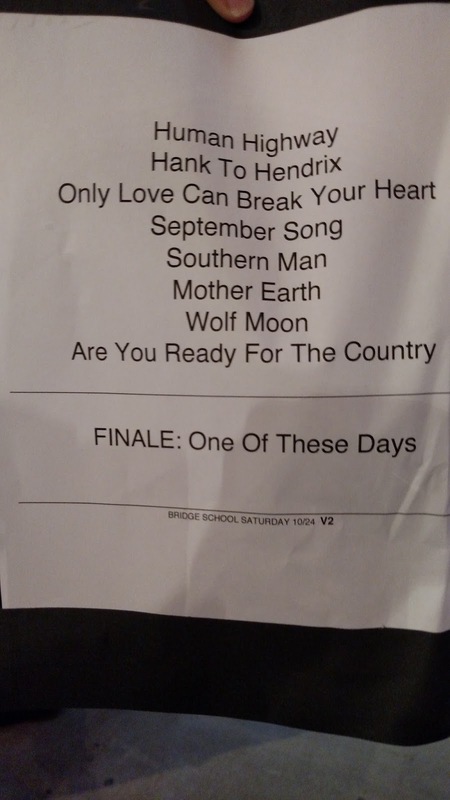 Sheryl Crow also did a fine job with her set, igniting smiles and singalongs during such fan favorites as "If It Makes You Happy" and "A Change Would Do You Good." The future Rock and Roll Hall of Famer was definitely in the mood to collaborate, calling out the Dixie Chicks, blues-rocker Gary Clark Jr. and indie-pop fave St. Vincent to join her onstage. St. Vincent and Clark also put on their own winning solo sets, while Ben Harper and Spoon definitely appealed to the crowd. Many fans had left by the time Young and Promise of the Real (with Nils Lofgren on piano) took the stage around midnight, kicking off the night's final set with "Human Highway." Can you find any info on this Neil biopic story on cbc.ca? Lots of questions. The Neil Young bio story is actually from a parody Canadian radio show. It isn't true. ...ha, my Mom got duped by the 'This Is That' radio show. Hi. A big thank you to Howell, Thrasher, Harry and all the other Rusties we met. It was our first OPL and Rust Fest Feast. What a great bunch of people. We had a great time. Especially collecting a unique souvenir (plus a near death experience) to seeing Neil and Lincvolt on Highway 101. Can't wait till next year. Great to see everyone @ Bridge! Fun times with The FarmAidians Paul & Renee! See you next year @ 30th Anniversary. And then there was Neil Young. One of the great tragedies of the Bridge School Benefit Concerts is regular attendees leaving before Young closes out the show. Spoiled by his presence every year, they don’t see a need to stick around. It is a privilege to see an artist of Young’s caliber, and there’s nothing routine or expected about his performances. While cherished classics like “Sugar Mountain” and “Harvest Moon” often make his setlists, seeing a legend in the flesh should always be cause for celebration. Young has differentiated his Bridge School performances by playing not only as himself, but also with Crazy Horse, occasionally as Crosby, Stills, Nash, and Young, and once as the reunited Buffalo Springfield. For this year’s shows, he was joined by the Promise of the Real, a band featuring Micah and Lukas Nelson, two of Willie Nelson’s sons and talented musicians in their own right. Lukas took lead vocals on a cover of Kurt Weill’s “September Song.” His voice was a deadringer for his father’s, and it was nice to see Young cede the spotlight to an artist he clearly holds immense respect for. After eight songs that included several politically charged numbers like “Big Box” and achingly poignant “One of These Days,” Young invited all the artists who performed during the day to retake the stage for a sing-along rendition of “Who’s Going to Stand Up?” off his 2014 album Storytone. It was a celebratory climax to one of the Bay Area’s great musical institutions. Long may it run. - For the love of God, please stop complaining about the lineups every year on music blogs and comment sections. This concert is a benefit for severely disabled children. Neil Young gets the best talent available to donate their time, and even if the show was just Neil by himself, it would be well worth the ticket price. Sure, some years are more stacked with talent than others, but my goodness is it beside the point. - St. Vincent was busy. Aside from her own set, she guested with both Sheryl Crow and The Dixie Chicks, two unlikely collaborations that produced some of the evening’s most memorable moments. 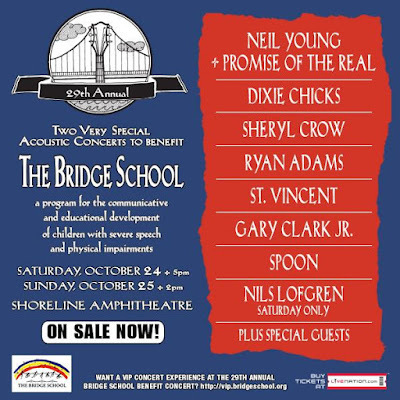 - Sadly, no Bridge School show I’ve ever attended seemed less crowded than Sunday’s show. Hopefully the Shoreline is packed next year when the concert celebrates its 30 year anniversary. Critic's paragraph 1 explains paragraph 3! The dogs didn't like the dogfood as much! @Renee & Paul - that's so wonderful. It was great meeting your son and we hope to see you both again soon down the road. @TOM - sorry, we're a bit pressed here. Help us out and connect the dots for everyone. less cropwdwd means ticket buyers bought less tix cuz lineup was cpeeceived as not as attractive. Your tale sounds like it would be perfect for one of their songs. Something in a 2/4 slow gallop, with probably Mike Mills on lead vocal. Maybe titled "ALCS and RUST"? I'll get working on that ASAP! Neil and Pegi look real good together! Amen to this : For the love of God, please stop complaining about the lineups every year on music blogs and comment sections. This concert is a benefit for severely disabled children. Neil Young gets the best talent available to donate their time, and even if the show was just Neil by himself, it would be well worth the ticket price. Sure, some years are more stacked with talent than others, but my goodness is it beside the point. I have seen 17 BSB years and sometimes both shows per year. Even acts you never heard of or think youll not like you end up enjoying. Its hard not to have a wide grin the whole time.